Elba Island is famous for its extraordinary seabeds, the clear water and the richness of species that inhabit the underwater environment. It is a sea that presents you with unique emotions thanks to its rock walls full of coral colored fans called gorgonian and its majestic underwater canyons populated by moray eels in living in closely with the cleaner shrimps. Then there are highly intelligent octopus, fascinating bernard hermit crabs carrying anemones on their shells for camouflage, sea slugs in sparkling colors, friendly groupers of a considerable size, and many other interesting elements of flora and fauna. When you are under water it is not uncommon to come across large deep sea fish such as barracuda, snapper and sometimes tuna that keep close to the coast in search of shoals of damsel fish and for those who like diving, assisting in the hunting of the big fish eating the small ones is an extraordinary emotion. Also very visible are lush meadows of Posidonia, erroneously called alga, as it is actually a real plant just as those on land, that through photosynthesis takes in carbon dioxide and releases oxygen, practically a real lung for the survival of our seas. This is also the environment where the fish lay their eggs and the young grow up. Looking through the leaves that sway to the rhythm of the waves you can find particular species such as spider crabs, or larger crabs with 8 long pincers and with a diamond shaped shell. Added to all these wonders are also shipwrecks, for instance the famous merchant ship sunk a few hundred meters from the beach of Pomonte in the south west of the island and a plane from World War II that went down in front of the lighthouse attached to the Napoleonic villa on the promontory in Portoferraio. 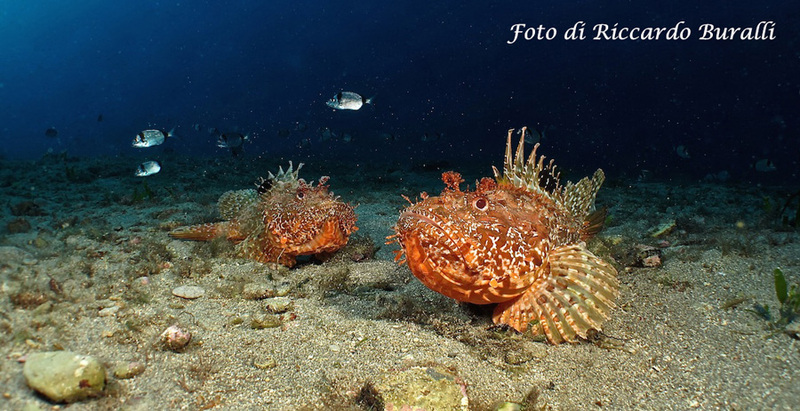 Many of the tourists armed with a divers license who annually visit the seabed Elba rely on the expert guides of local diving centers, but perhaps not everyone knows that you can become a diver during a your holiday on Elba. The basic course in fact less than a week and you can safely combine it with relaxing on the beach . The commitment is minimal and the theory can be studied under your beach umbrella by quietly reading it up in a book or on your tablet or smart phone. If you consider a proper course too challenging, you can have an inauguration or trial run in the sea just in a few meters of water accompanied by an instructor who will provide basic information and then show you the underwater wonders in complete safety. For more information and to find out about all of our diving points on Elba, visit www.divinginelba.com where you’ll find photos and a video to get a small preview of what awaits you underwater.